After the dark, occasionally creepy and disturbing tones of Batman: The Doom That Came to Gotham and Superman: Red Son, it seemed like this week was a perfect time for something fun and silly. 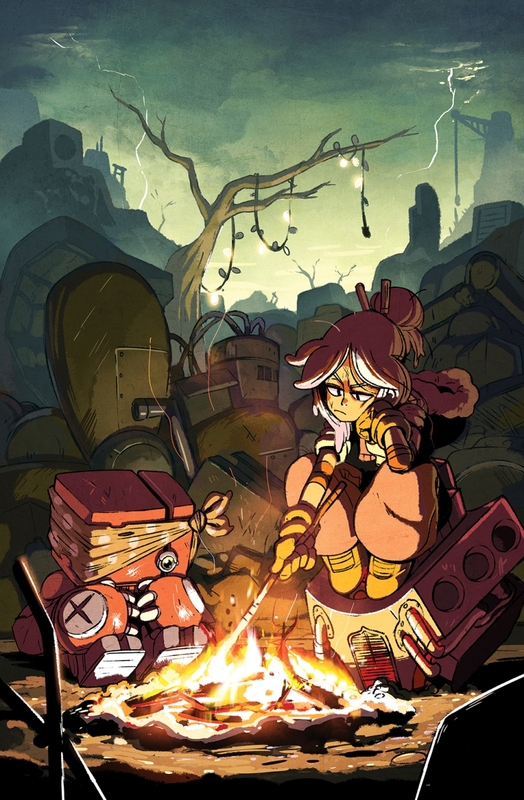 This week, I’m taking a look at a wonderful, indie steampunk story called Tyson Hesse’s Diesel. As you might guess, Diesel is both written and illustrated by Tyson Hesse, who is most well known for his web comic Boxer Hockey. Diesel is Hesse’s first original series and is composed of just four issues with hopefully more to come. 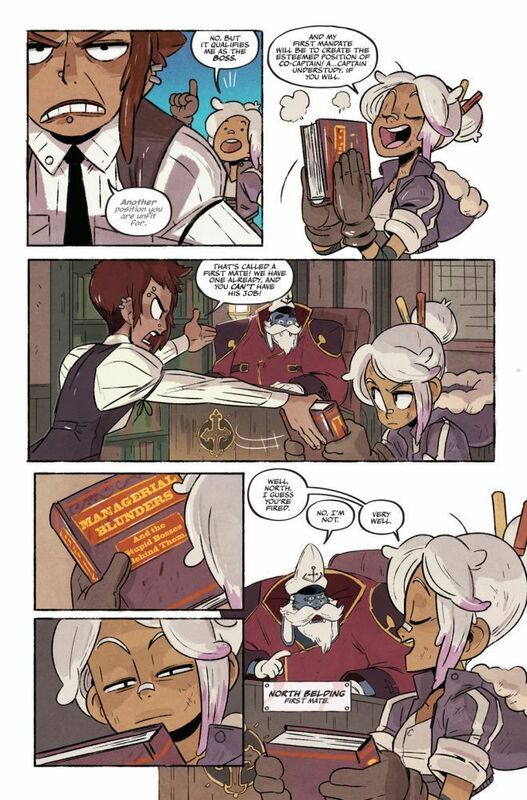 It’s a completely irreverent take on steampunk fantasy with a main character who is just almost more lovable because she’s a constant failure. Chock full of sarcastic humor and a surprising amount of heart, Diesel is a difficult story to put down. Diesel takes place in a world dominated by a nation of mostly humans known as Gass and which is comprised largely of floating airships, a nation of birdmen known as Terrapin and an underworld with various other races. The story follows a young girl named Dee Diesel who lives on an airship known as Peacetowne. Dee is the only remaining daughter of a renowned inventor, Tungston Diesel who created Peacetowne and was beloved by its inhabitants. Tungston disappeared years ago and is assumed to have been killed by the birdmen who had been hunting him. As his heir, Dee expects to inherit the airship on her eighteenth birthday. Unfortunately, Dee’s expectations are about all she has going for her. Unlike her brilliant father, Dee isn’t particularly talented at much of anything. Everything she tries to create in the garage workshop ends up exploding, she has no piloting or leadership skills and therefore no claim as captain of the ship and while she tries, she’s also a bit of a smartass and ends up frustrating everyone around her. 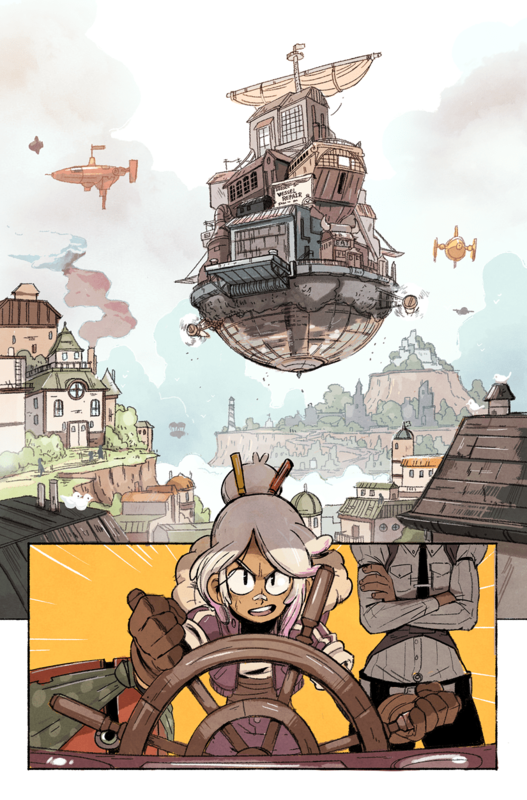 But then a mysterious flying ship crashes onto Peacetowne, leading Dee to go head-to-head with Peacetowne’s captain and discover a mystery including a her missing father that will send Dee on an adventure in the underworld. In the process, will Dee find something she’s actually good at or just become more of a disappointment? Diesel isn’t one of those heart wrenching stories that grabs you up yet it manages to hold your attention to the last page. It’s pure irreverent fun from issue one to four and I loved every second of it. It’s a relatively simple story that is cute and funny enough for really any age. The interactions between the characters are particularly humorous, as they constantly snipe at each other. Dee, in particular, can’t seem to get along well with anyone and some of the best humor is the back and forth moments between her and her rival, the ship’s captain. Hesse has even put jokes into the detail of the story, down to the sarcastic book titles that populate the captain’s library. I couldn’t help laughing throughout the entire series and it’s a humor that would definitely appeal to anyone who speaks the language of sarcasm. I have to admit that what makes Diesel such a fun ride is actually Dee herself. She’s about as imperfect a heroine as you can get. Since she was a kid, Dee has known that she will inherit Peacetowne so she hasn’t actually bothered to get good at much of anything. She certainly didn’t inherit her father’s mechanical skills and despite years of “working” in the machine garage, she can’t manage to make anything that actually works. In addition, she can’t seem to not irritate the captain of Peacetowne and constantly lives under the threat of being kicked out. Living under the shadow of her father’s greatness, Dee seems to really struggle with who she is and who she wants to be. All of this makes Dee a remarkably sympathetic heroine. When her screw ups lead to Dee having to make her own way, it’s hard not to hope along with Dee that she can find a way to be useful and find out what’s happened to her father. Graphic novels in which the creator is both author and illustrator always seem to be hit or miss. In Hesse’s case, Diesel is an absolute hit. His whimsical, comic style is a perfect match to the irreverent tone of the writing. For being his first book series, Diesel is damned impressive. There are certainly aspects that I hope will be explored in future issues and the fourth issue leaves all kinds of problems unresolved. However, Diesel certainly piqued my interest and is easily one of the most interesting science fiction graphic novels that I’ve read in a long time. If you enjoy fun, irreverent stories and the airships of steampunk science fiction, I’d highly recommend checking this one out!